How’s this for an extra special deal: Buy a SeaWorld Orlando Annual Pass, get an Aquatica Orlando Annual Pass for Free. That’s about as good a ‘theme park 2-for-1’ as it gets! Featuring a terrific assortment of rides, shows and exhibits, Aquatica Orlando promises unlimited fun for the entire family. It’s heating up in Florida, so now is a perfect time to grab the swim trunks and flip-flops and dash to Aquatica Orlando. You can spend the day at SeaWorld’s water park on high-speed slides and cruising across wave pools, lounging on tranquil beaches, and visiting magnificent animal habitats – all in one day! We’re talking 38 slides, rivers and lagoons and 84,000 square feet of sparkling white, sandy beaches. Bring the sunscreen and shades and prepare for Ihu’s Breakaway Falls™ – the tallest, steepest and only multi-drop tower slide of its kind in Orlando. Or, check out Walhalla Wave, a thrilling ride for the whole family, zooming you through a 6-story maze of twists, turns, and tunnels before you surge back out into daylight. One of the most popular rides in the park is the incredible Dolphin Plunge. Two side-by-side enclosed tube slides send you racing through an underwater world that is home to a playful pod of beautiful black-and-white Commerson’s Dolphins. Known for their playful nature and electrifying speed, you may well see them racing right alongside you as you zoom by. All this fun in the sun at Aquatica Orlando can be yours for free for a year when you purchase an annual pass for SeaWorld Orlando. How great would it be to spend a long vacation jumping between SeaWorld and Aquatica? Right now at SeaWorld Orlando there’s still plenty of time to enjoy the Seven Seas Food Festival, where you can feed your appetite for adventure with amazing cuisine and live entertainment. The festival is happening now and runs on consecutive Saturdays until May 13. And along with all the sensational rides and attractions at SeaWorld Orlando, this summer will see the debut of the Kraken® Virtual Reality (VR) Roller Coaster, the park’s first digitally enhanced ride experience. There’s also Dolphin Nursery, giving guests the opportunity to see mother and baby dolphins up close like never before. 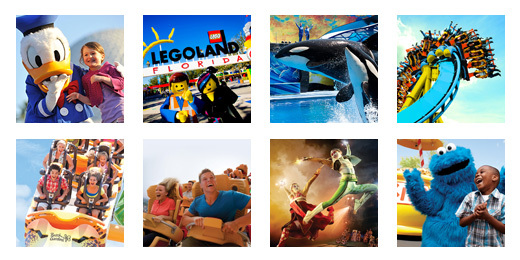 As you can see there’s lot to do at both SeaWorld Orlando and Aquatica Orlando – family-friendly theme parks that deliver year-round fun for the whole family. Check out this great deal today on TicketsatWork.com : Buy a SeaWorld Orlando Annual Pass, get an Aquatica Orlando Annual Pass for Free.